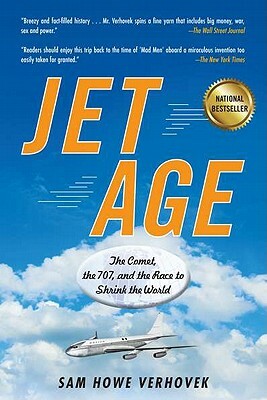 In Jet Age, journalist Sam Howe Verhovek explores the advent of the first generation of jet airliners and the people who designed, built, and flew them. The path to jet travel was triumphal and amazingly rapid-less than fifty years after the Wright Brothers' first flight at Kitty Hawk, Great Britain led the world with the first commercial jet plane service. Yet the pioneering British Comet was cursed with a tragic, mysterious flaw, and an upstart Seattle company put a new competitor in the sky: the Boeing 707 Jet Stratoliner. Jet Age vividly recreates the race between two nations, two global airlines, and two rival teams of brilliant engineers for bragging rights to the first jet service across the Atlantic Ocean in 1958. At the center of this story are great minds and courageous souls, including Sir Geoffrey de Havilland, who spearheaded the development of the Comet, even as two of his sons lost their lives flying earlier models of his aircraft; Sir Arnold Hall, the brilliant British aerodynamicist tasked with uncovering the Comet's fatal flaw; Bill Allen, Boeing's deceptively mild-mannered president; and Alvin "Tex" Johnston, Boeing's swashbuckling but supremely skilled test pilot. The extraordinary airplanes themselves emerge as characters in the drama. As the Comet and the Boeing 707 go head-to-head, flying twice as fast and high as the propeller planes that preceded them, the book captures the electrifying spirit of an era: the Jet Age. In the spirit of Stephen Ambrose's Nothing Like It in the World, Verhovek's Jet Age offers a gorgeous rendering of an exciting age and fascinating technology that permanently changed our conception of distance and time, of a triumph of engineering and design, and of a company that took a huge gamble and won. Sam Howe Verhovek has been a reporter for The New York Times and the Los Angeles Times for more than twenty-five years. His assignments have taken him around the globe, to riots in India, the war in Iraq, and the longest school bus ride in America. He lives in Seattle.